Kadjisdu.áxch is the name of the artist who is credited with creating the four houseposts in the Whale House Collection: the Strong Man or Black Skin Post, The Woodworm Girl, The Sea Creature Post, and the Raven Post. The Collection also includes the woodworm feast dish and the famous Rainwall Screen. Though some credit a Tsimshian artist for creating the Rainwall Screen other scholars believe it was created by Xetsuwu, a Gaanaxteidi leader who built the great Whale House seen in the ubiquitous Winter and Pond photos of the Whale House taken in the late 1800’s. 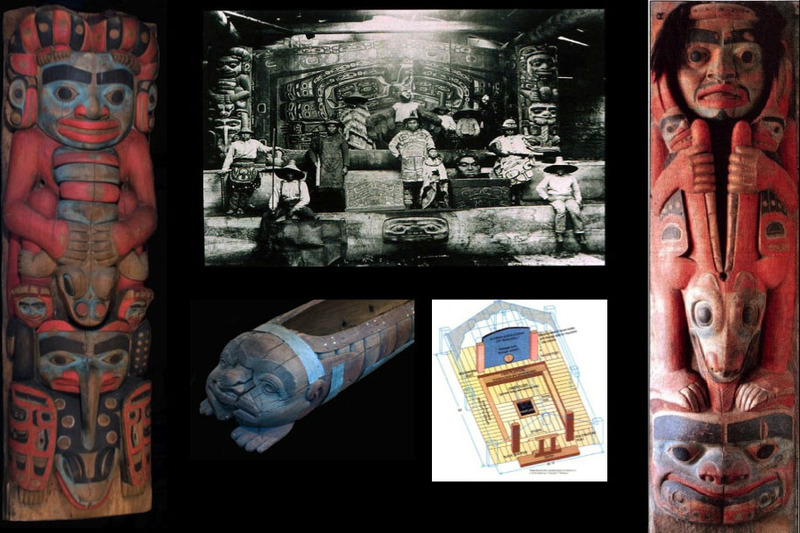 Louis Shotridge, a Tlingit man from Klukwan, credits Xetsuwu for carving the screen and one of Xetsuwu’s successors with painting the famous Rain wallscreen. The Whale House Collection is considered by many scholars/collectors of Northwest Coast Art to be some of the finest examples of the art form from that era. Collectors have coveted the collection for years and there have been several unsuccessful attempts to purchase them. The Chilkat Indian Village Tribal Government passed special legislation in the late 1970’s that made it unlawful to remove or sell clan owned artifacts from the village of Klukwan in response to the pressure that art collectors were putting on village members to sell clan treasures. The Klukwan members of the Gaanaxteidi clan decided in January of 2013 to place the collection in the JKCHC facility, on a loan basis, and their decision was later agreed to in a larger gathering of the clan on June 2, 2013. The collection will be the center piece of the new Jilkaat Kwaan Cultural Heritage Center and Bald Eagle Observatory facility and the community has planned to have local carvers build a replica clan house interior to place the collection in. To have these clan treasures on display in Klukwan, in their place of origin will add so much to the experience of those who will come to see them than if they were in a city far removed from the people and culture they originated from. Another benefit of having the collection remain in Klukwan is that the replica clan house, with the Whale House Collection, will be made available to the Gaanaxteidi clan’s for ceremonial use. Access to the collection and use of the display area for ceremonial use is written into the loan agreement between the JKHC non-profit and the Gaanaxteidi Clan. If you are interested in supporting our efforts to properly house and care for the Whale House Collection please click on the green “donate now” link and you can make your donation on-line, or you can send a check in the mail to: Jilkaat Kwaan Heritage Center, P.O. Box 976, Haines, AK 99827.